Looks great, easy to use, minimalist looks. The mirrored door will show fingerprints. The RHM2231 is a very minimalist looking microwave, with an unusual 22 litre capacity and 800w power output. The front section features very few buttons, with just 5 buttons arranged in a vertical line. Despite this, the silver microwave is pretty easy to use - the controls are clearly labelled, and none of any of our testers had any issues operating the appliance. 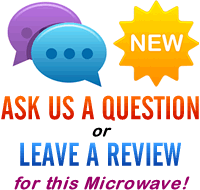 The logo is fairly prominent, but the majority of our test team liked the overall design of this solo microwave. The clock and digital LED timer are bright red, and are easy to read in both dark and light conditions. The door section features a smart mirrored finish - it will show fingerprints, but it does look pretty good next to the silver body of the Russell Hobbs microwave. Inside it features a 24.5cm turntable, and exterior dimensions are 28.2cm by 47.0cm by 37.7cm. 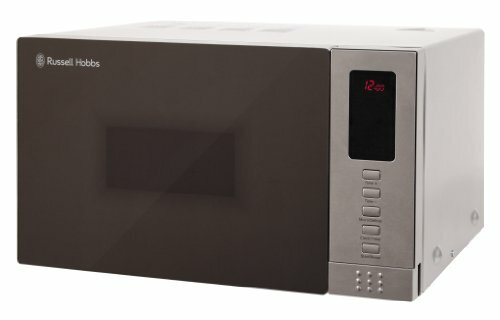 The RHM2231 is a small solo microwave with a smart, yet modern finish. It works well, and build quality feels pretty good. We liked it.